• "To win the FedExCup and to be as consistent as I have been all year is something that I'm very proud of." • "I think it's just one of those things where obviously I'm a little disappointed I didn't win (THE TOUR) Championship because I was right there. But the FedExCup is something very similar to what you have for Player of the Year. It's a cumulative total and something that you have to be consistent the entire year, and it's something that I was." • "This year we had a lot of unknowns going into the Playoffs this year, how it was going to turn out because of the resetting and guys could have gone the entire year without winning an event and still won the FedExCup. But ... the whole idea is to play well at the end, and that's kind of how it's structured." After missing more than eight months of competition on the PGA TOUR following knee surgery after winning the 2008 U.S. Open, Tiger Woods returned to action at the World Golf Championships-Accenture Match Play Championship. Woods went on to record five victories during the PGA TOUR's regular season to enter the Playoffs No. 1 in the FedExCup standings. With a runner-up at The Barclays and a victory at the Deutsche Bank Championship, Steve Stricker jumped Woods for the top spot after two evens. Woods moved back into the No. 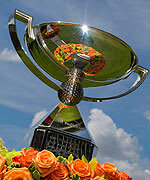 1 spot with a convincing eight-stroke victory at the third playoff event, the BMW Championship. That put him in position to claim the FedExCup title with a second-place finish at East Lake behind Phil Mickelson. Woods, who also won the inaugural FedExCup in 2007, has 14 top-10 finishes in 16 stroke-play events in 2009.